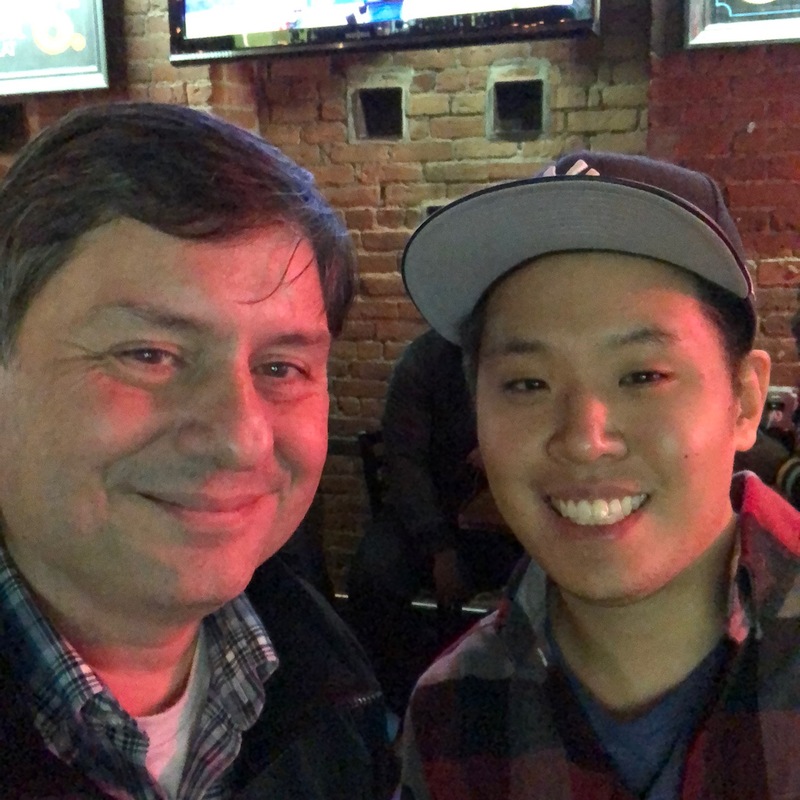 Comedian John Kim and me. The biggest fear for many, apart from death, is a fear of rejection! Well, I say, Fugetaboutit! In fact, if you’re in New York City, I encourage you to consider doing what I did: go up and do an open mic at a comedy club! Yes, that is what I did as part of an Airbnb experience, “Learn Stand-up with a Comedian,” hosted by Rishi and John, both NYC-based comedians there to show you around the NYC comedy scene. You can certainly just observe but I felt I was ready to jump in and go on stage. 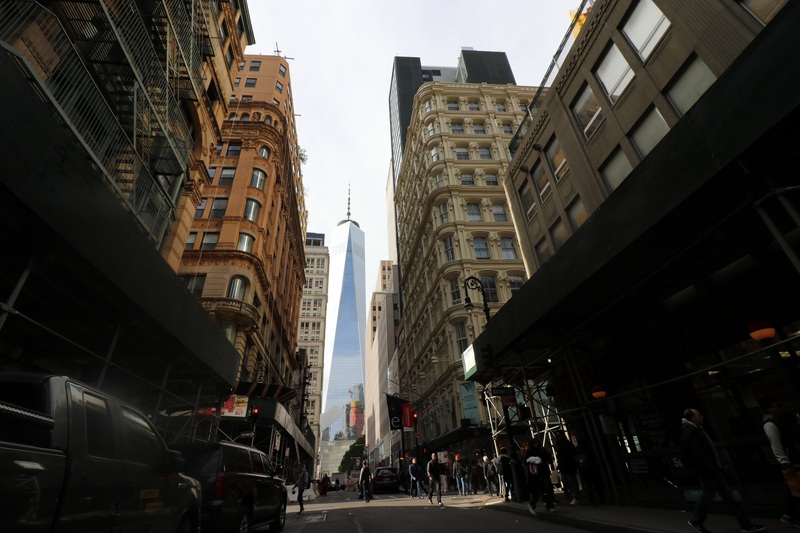 New York City has been described as the cultural, financial, and media capital of the world–and that definitely includes comedy. Within the closely knit area of Greenwich Village, are a number of comedy clubs all with their own energy and history. And, at the epicenter is the Comedy Cellar where on any given night you might get to see such legends as Amy Schumer and Jerry Seinfeld. With the help of my mentor for the evening, comedian John Kim, I got quite an immersive experience. I learned a lot and was fueled with plenty of inspiration which made going up on stage for open mic all the easier. And what a stage! 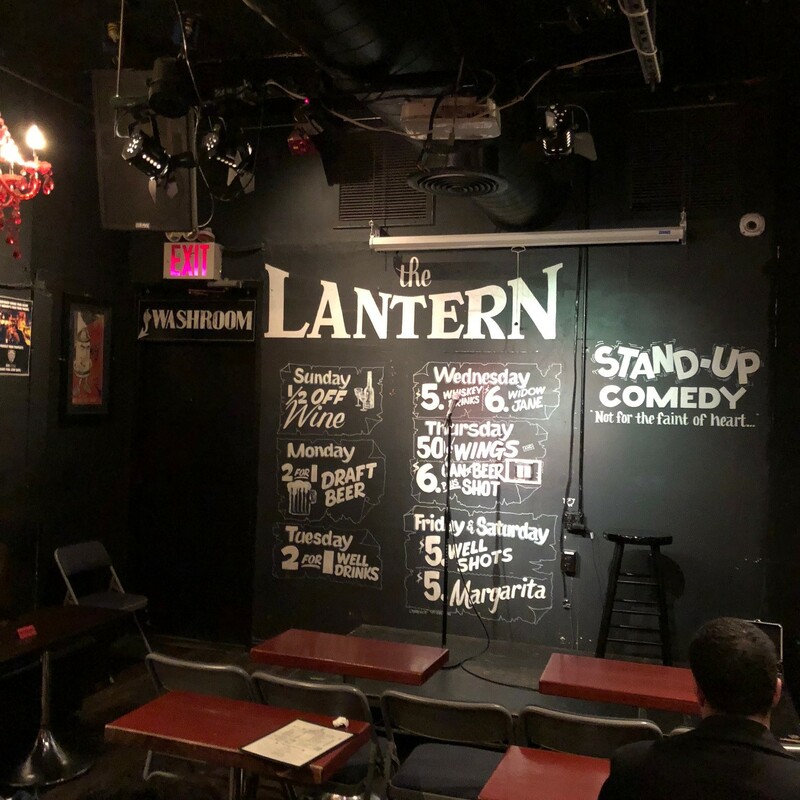 I couldn’t have asked for a better venue for a first-timer, The Lantern Comedy Club! The great challenge is in confronting any doubts: Is the material good enough? Am I good enough? Yes, trust me, you’re more than worthy to go up on stage and just give it a try. More than likely, or let’s say it’s just about a guarantee, any misgivings will melt away once you start. Something will trigger in your brain: Go! Okay, here’s the next hook! Stop, try to pause. Go! Add this. Don’t say that just yet..okay, say it now. You get into a frame a mind and, yes, your mind is a beautiful thing and it’s in it to win it. Thanks to my beautiful mind and to such an insightful and inspirational guidance from John Kim, I did more than just get through my set. I really learned and grew from the experience. And, just like hitting the gym, you know when you’re in the zone and you know you want to get back to it again and again. Here are some of the photos that I took with pro photographer Abdiel Colberg. He is a very kind, patient, and thoughtful person. Such a talented artist who was so generous with his knowledge. Here are some photos I took under his guidance. Check out his website right here. And check out the Airbnb course right here. Be ready to walk around and take some great photos! 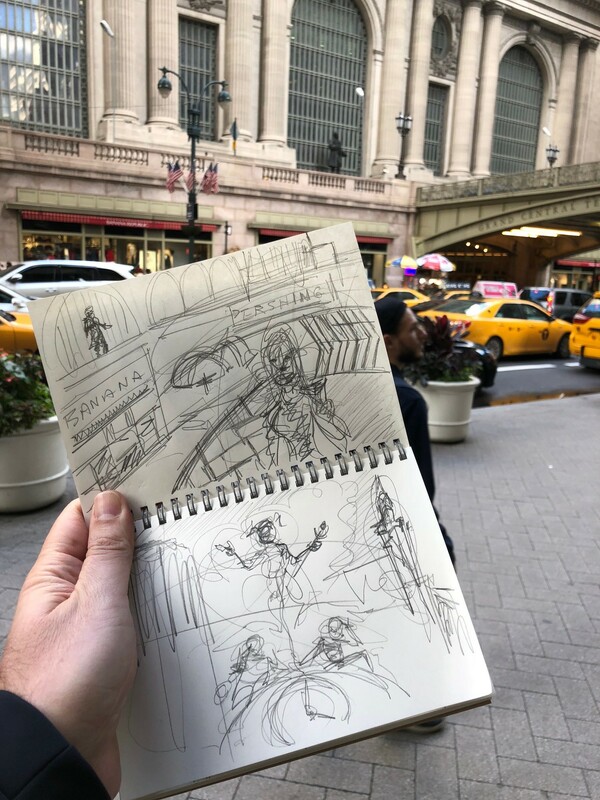 Here I am drawing Grand Central Terminal. You can’t deny someone what they love because love will find a way. So it is with me and drawing. I’ve always loved drawing. I draw very well, if I do say so myself, and I don’t have to make excuses for it, thank you very much. You wouldn’t begrudge a ballerina for dancing very well or a professional singer for singing very well. I think you know what I mean. I think I know my way around words too but that’s another story. It’s not about conceit. No, it’s simply talking about how someone is built. This is what they know. What I’m getting at is that I took a drawing work shop recently. The photos here of my efforts during the session. The truth is that any artist, no matter how good, can always make good use a creative workout. That’s why life drawing sessions are so popular: most of the people aren’t trying to learn the basics. No, they’re having a creative workout. 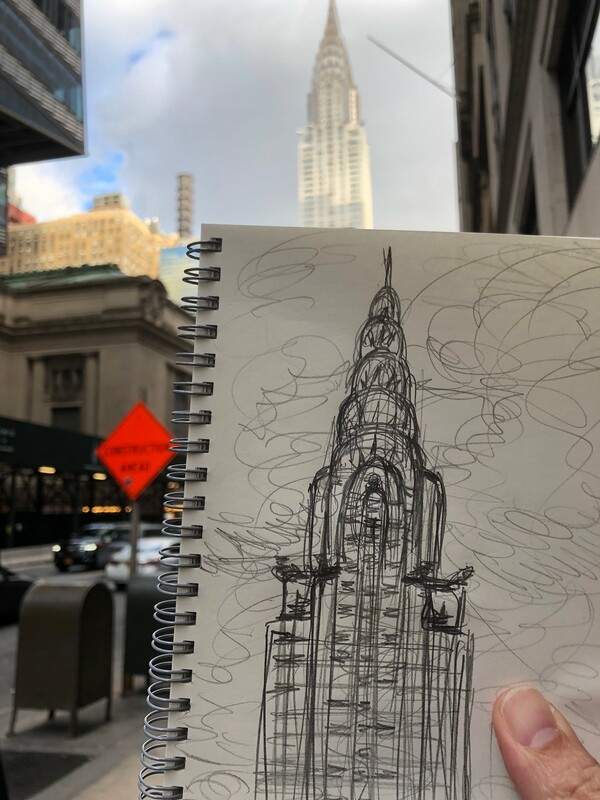 So, I was beyond pleased to discover this drawing session offered through Airbnb during my stay in New York City. Wow, you just can’t go wrong and, let me come back to this, your skill level is NOT the important thing. Say, you went to do a yoga session. It’s like that. Everyone moves at their own pace. Funny I should mention yoga as the instructor for this Airbnb experience, Ben Ponté, is both an artist and a yoga instructor. Well, it makes total sense to me. With all that said, I had a blast. And maybe, at my relatively high skill level, I was tapping deeper into our shared activity than one could expect from a novice. Again, it doesn’t matter. First, I’ve spent a lifetime developing my art. If someone walks in and is trying out something they are new or unfamiliar with, they are simply going to need to take things one step at time. Look, I’ve been hitting the gym regularly since the start of this year and it has become very apparent to me that I’m at a beginner level to say the least. I’m more into recovery exercises from years of being a coach potato. Well, maybe not a total coach potato. But, there you go, we all have our stuff to work out. The moral to this story is pretty straightforward. Be passionate about life and go out there and tackle new things but know your limits. If you have to take small steps, then so be it. Before you know it, you’ll reach a master level. It’s good for the soul and just plain fun to reach a certain skill level. I have my faults but I can always come back to the drawing board in more ways than one. And, at an actual drawing board, I feel right at home. I found a moral but the big point also is that I sense everyone had a good time under the leadership of our very upbeat and accessible instructor. Yes, I can’t praise Ben’s course more than to state right here that it really got me thinking and got me motivated. I’m telling you, it’s a creative workout–and we all need that. Everyone can lay down a mark and express themselves. That is one of the big secrets, I suppose, to drawing. It’s all about process. The only way you’ll get it is by actually doing it. The same thing with going to a gym: the only way you’ll get results is by actually working out at the gym. You’ll have to pardon my rambling, if it comes across that way. I just felt like jotting all this down. I’m still in New York City as I write this. And I’m still right in the middle of a thousand and one things related to being in New York City! Ah, the city that never sleeps! Alright, I had better find a way to wrap up. Well, I highly recommend Airbnb for so many reasons. For the purpose of this post: try out the Airbnb experiences! 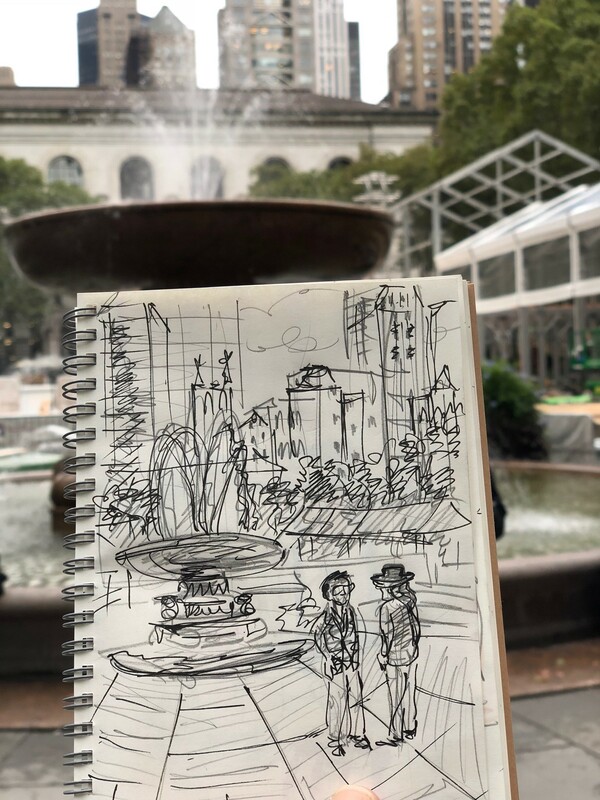 And, when in New York City, get your Airbnb creative drawing workout from Ben Ponté! Vist Ben right here. 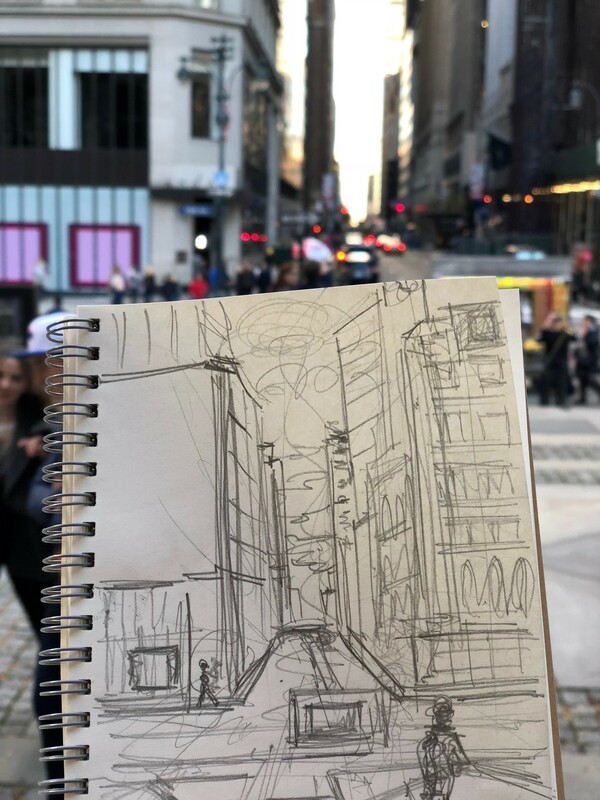 Check out his Airbnb session, “Sketch Your Way Around New York” right here. Look in the About section to his website and M. Jacob Alvarez says of himself: “M. Jacob Alvarez is a cartoonist, comedian, and chemical engineer (seriously dude, silly drawings and conspiracy theory jokes don’t pay many bills…)” How true! Well, being a chemical engineer is an astonishingly good place to be if you want to create a graphic novel. Less to worry about or more room to worry about other things–since there’s always something. How about if you’re young and vulnerable? That is exactly the subject matter Alvarez tackles in his new graphic novel, “Chinatown Bus.” It is a heart-felt exploration of hipsterdom–and Alvarez’s irreverence serves him well here. There’s a certain time in your life when you will not only tolerate, but even revel, in drinking cheap beer from a Solo plastic cup, sold to you at a premium price since you’re in a chic nightclub (which ain’t so chic). There you are under a low ceiling packed in a little sweatbox with a bunch of other scenesters pretending to like a really bad band. So intense! 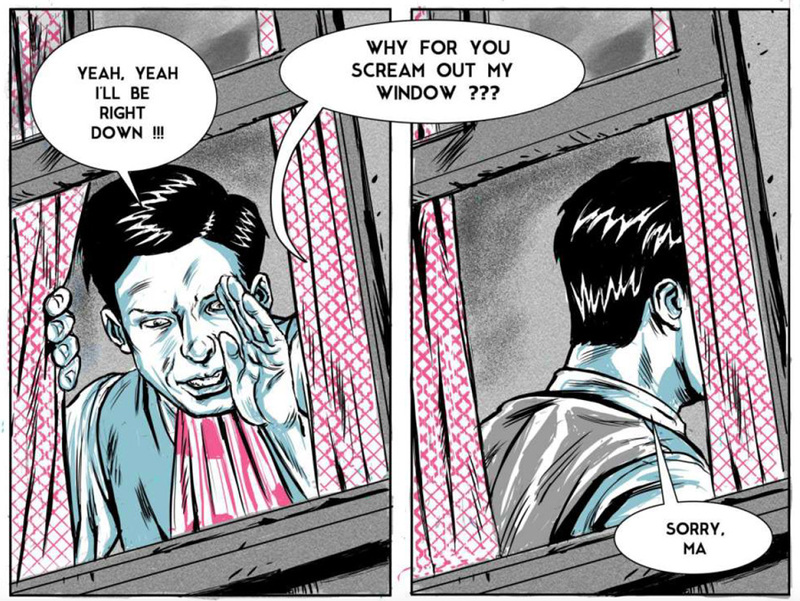 The aim of Alvarez’s 84-page graphic novel is not so much to satirize. More like to bear witness. While not an autobio comic, Alvarez admits in his forward to being very familiar with the struggles of his young characters. Alvarez has a wonderfully energetic and cartoony style that is accessible and inspires empathy with his characters. Lyn is a guy from Philly taking the Chinatown Bus to New York City. He is in a long distance relationship and is sort of feeling stuck. All it takes is a text miscommunication from Kelly, his girlfriend, and Lyn is ready to call it quits. To his credit, Lyn is certain that Kelly has just dumped him. There is a cute passenger he’s been eying and so he decides to confide in her. Jane, flattered to have Lyn open up to her, invites him to hang out with her. It turns out that Kelly did not really dump Lyn, at least not outright. Alvarez really enjoys setting things up and then lighting the fuse. A fine example is once all three of these characters meet. Jane ends up knocking Kelly out cold. Lyn explodes and unleashes his fury upon Jane. He chastises her. Turn the page and Jane is full-on outraged for being called a drama queen. Three more pages, and we see Lyn’s steady descent, completely alone and deflated. Any reader will enjoy a gritty urban tale about young people trying to find themselves. These characters definitely have their flaws and are prone to hide behind caustic remarks but Alvarez presents it all with a human touch that will resonate with the reader. This is a great example of a cartoonist’s debut graphic novel. Alvarez has successfully followed through on a specific theme and vision. “Chinatown Bus” is available at multiple comics shops including Philadelphia, Chicago, San Francisco, and Columbus, Ohio. For more details, visit M. Jacob Alvarez right here. Cartoonist Julia Wertz has a distinctive outlook (irreverent, pithy, snarky) that has gained a loyal following of readers. With her latest work, she brings her unique style to bear on the Big Apple. It is an honest, funny, and insightful approach to learning about how cities evolve, particularly New York City, the quintessential urban mecca. Early in her cartooning career, Wertz said she resisted writing some sort of coming-of-age book set in NYC. 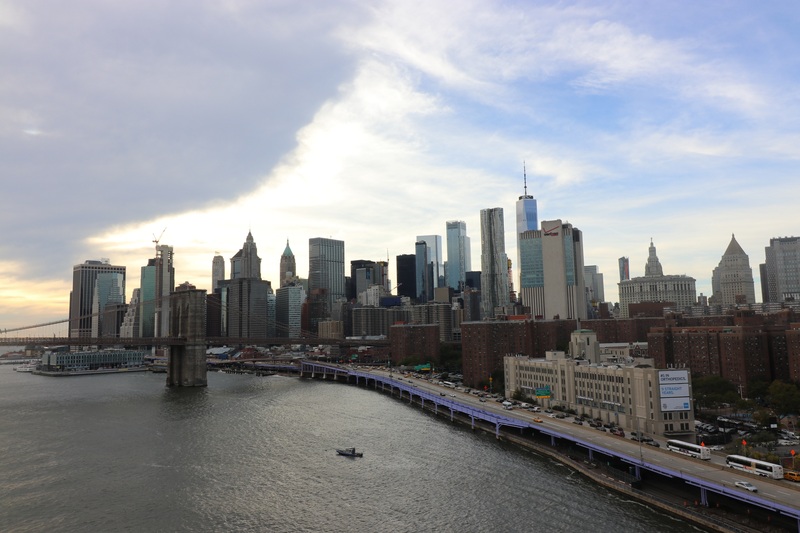 Now, more mature, she can dish on the history of the city that never sleeps while also, inevitably, sharing something of her journey of self-discovery. It all makes for an intoxicating blend: “Tenements, Towers & Trash: An Unconventional Illustrated History of New York City,” published by Black Dog & Leventhal. Wertz sets up a poignant and vulnerable starting point: the remains of the New York World’s Fair of 1964. It’s not a pretty sight. No, it’s a mishmash of faded totems to the future. Ironic stuff, indeed, irresistible to a wise-cracking cartoonist! Surely, you know that most, if not all, cartoonists have a sardonic sense of humor. And Julia Wertz is just the sort of sardonic tour guide you would want. But it’s not just about the snark–far from it. Sure, Wertz puts the 1964 World’s Fair through the wringer, deeming it a celebration of corporate-sponsored consumerism. Now, the 1939 New York World’s Fair had style but, in its own way, it too was a celebration of corporate-sponsored consumerism. This sort of comparison easily lends itself to delving deeper and therein lies what this book is about, what makes it unique and beautiful. 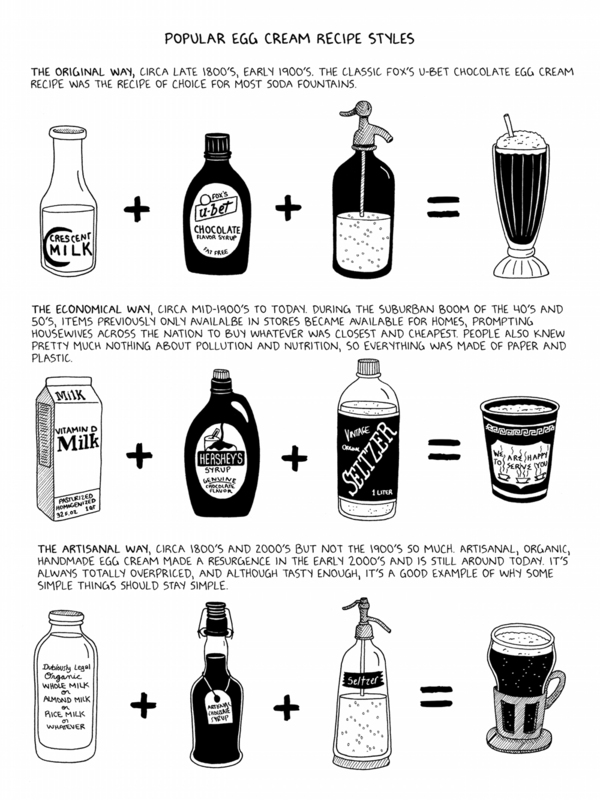 Egg Creams, best to keep them simple. 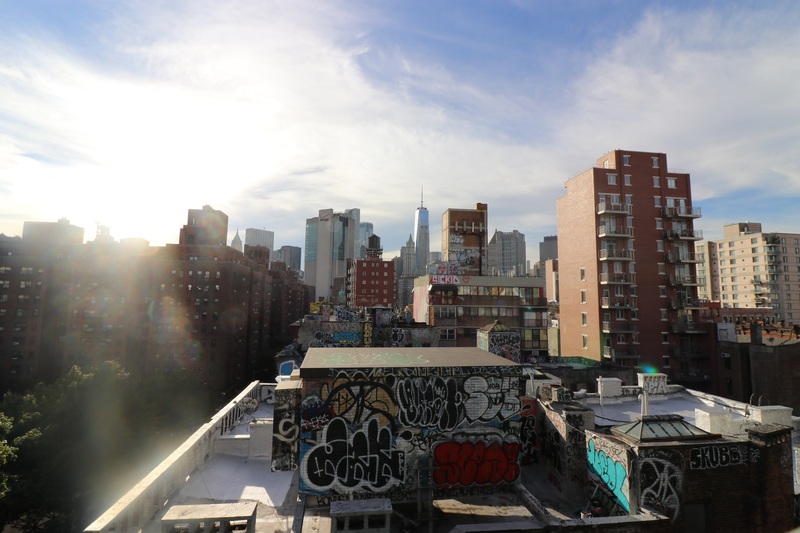 New York City is all about the tension between the pretty and the not so pretty. Wertz revels in this fact. It seems as if she can’t get enough. Just when you think you have this book figured out, Wertz will delight the reader with shifts in narrative, compelling visuals, and overall heart-felt enthusiasm, the sort of lust and vigor you’d expect from an Indiana Jones in the jungle except this is Julia Wertz on countless urban expeditions. She tracks down everything: bagels, egg creams, The Village Voice, railroad flats, micro-living units. It’s all here and then some. I love New York almost beyond words. My heart goes out to Julia Wertz and her marvelous long walks spanning hours upon hours and covering multiple boroughs and miles. I highly recommend taking this book on a NYC trek of your own. It’s a hefty hardcover but, if you make it your primary item in your backpack, you’ll be just fine. 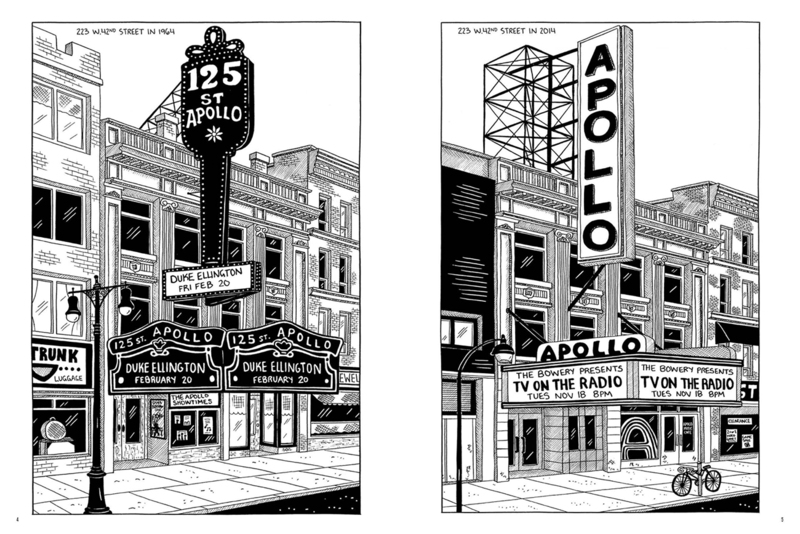 You can make your own comparisons and connections guided by all the amazing drawings that Wertz has to share of bygone and contemporary New York. This book is really an inspiring combination of prose and artwork and comics. This is simply a dazzling book collecting a treasure trove of insight and information and making it all feel like a carefree conversation. 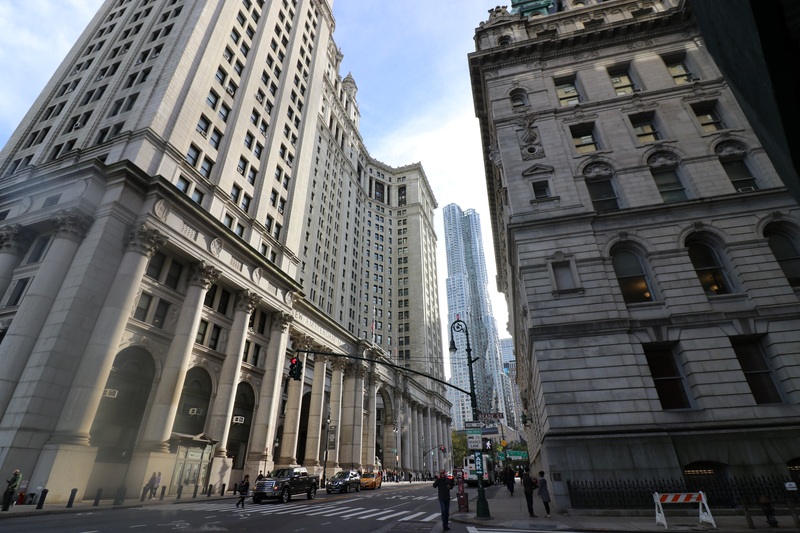 223 W. 42nd Street in 1964 and in 2014. 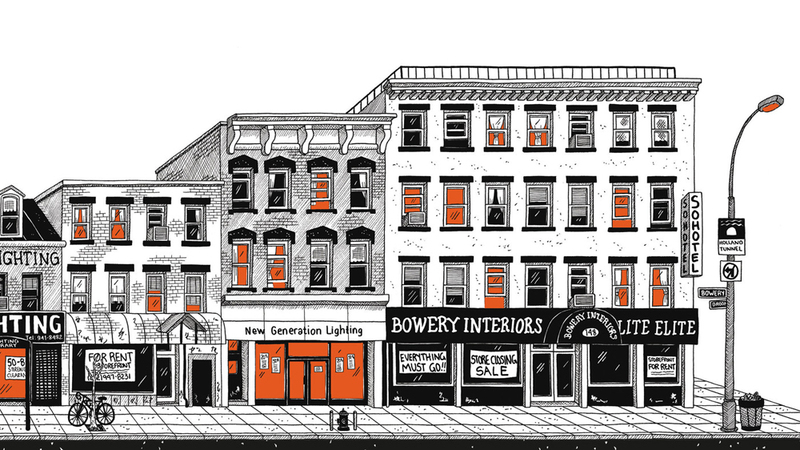 “Tenements, Towers & Trash: An Unconventional Illustrated History of New York City” is a 284-page hardcover published by Black Dog & Leventhal. If you’re in Seattle this weekend, be sure to stop by and see Julia Wertz at the annual comic arts festival, Short Run, or the the Seattle Public Library. At Short Run, on November 4th, Wertz will be giving a slideshow/talk about her urban exploring from 3:30-4:30pm at the Vera Project. And at the downtown Seattle Public Library, on November 5th, Wertz will hold a slideshow and conversation with cartoonist Nicole Georges from 2-4pm. There’s a lot of thought and care that goes into a solid work of comics but the results should be magical for the reader. Within the multi-layered world of independent cartoonists there is a fair amount of intrigue mixed in with camaraderie. Creators can get lost in a fog of competing interests. The answer is to find your way and simply pursue your vision. 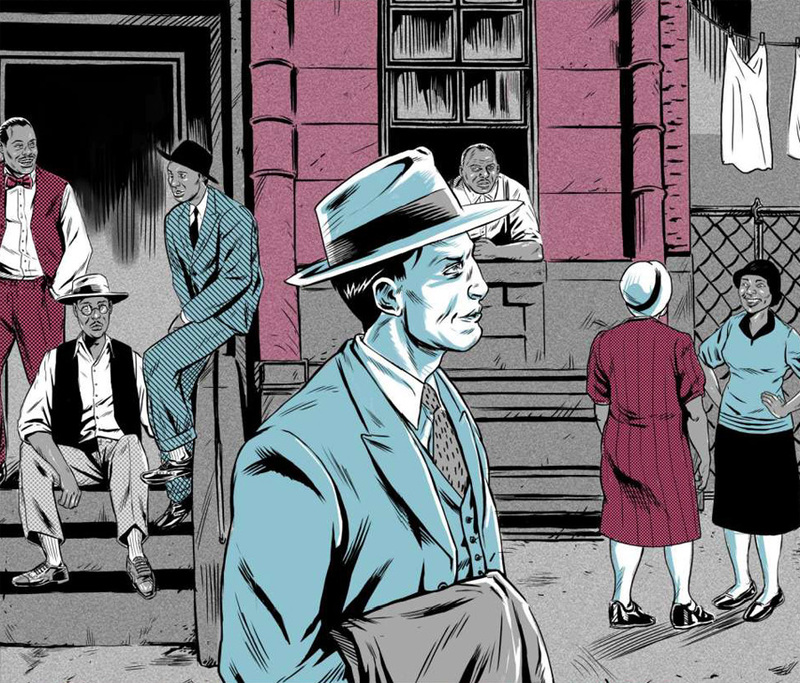 Cartoonist Craig Johnson II has tapped a significant vein of New York City history to create a comic both purposeful and entertaining. 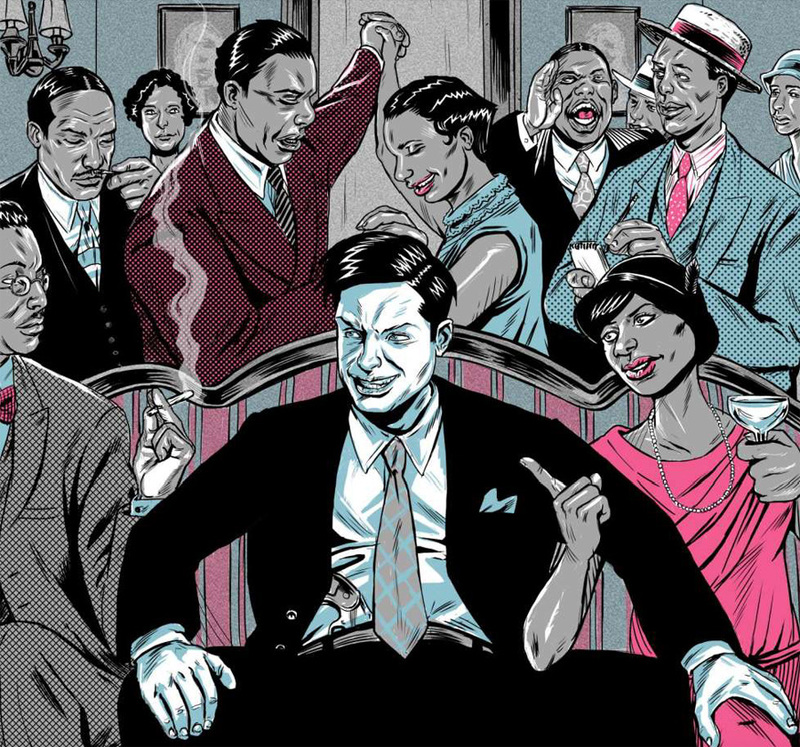 THE LEGEND OF PINKY, an ongoing series ultimately to be a graphic novel, published by Carbon Age Comics, is set in the early years of gangsters (1920s to 1930s), specifically involving the interconnections between Jewish and African American players. Harlem’s uneasy friendship with Pinky. 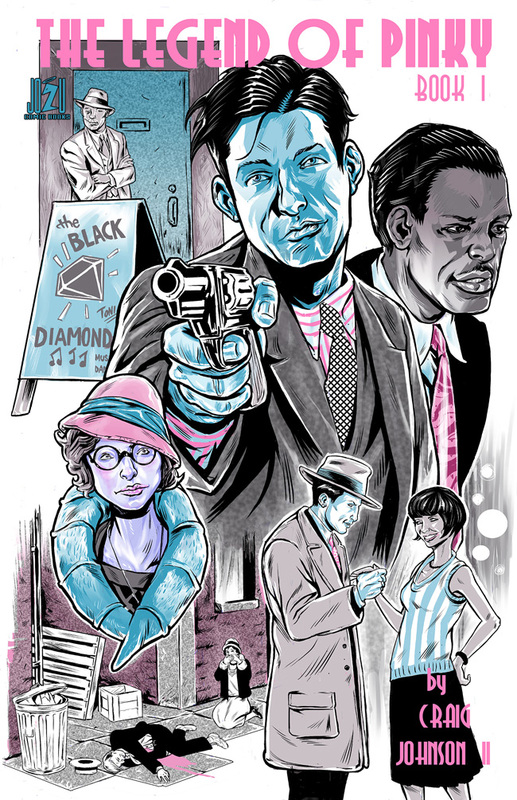 The main character is Irving “Pinky” Horwitz, a lean and mean trained killer in the Goldman gang. He is an exceptional assassin, when he bothers to do his job. Pinky’s biggest flaw is an utter lack of discipline. If there is a chance for him to feed his lust and ego, he will take it. And his favorite place to do that is Harlem. In that arena, reckless young women jump into bed with him and skeptical young men sometimes push back and sometimes accept him. With Pinky, and those in his orbit, Johnson has created one of the most fascinating comics currently available. The story begins with a pivotal moment gone wrong. Pinky was supposed to report for an important mob hit of two rivals. Instead, he was in bed with his latest conquest. Meanwhile, Sam, his partner, attempted the complete the two-man job by himself but was only able to kill one of the two men. And so begins the conflict that demands resolution in the first issue of this comic. Pinky, no doubt, is due his comeuppance. But Pinky is not without some redeemable traits. Clearly, Pinky seeks approval. There are two women in particular that he cares about: his own mother; and Yetta, a union organizer of garment workers. He takes great delight in showing most people his disdain. But, for a select few, he values some connection, especially the friends he seems to have made in Harlem. I am often asked what it takes to create a graphic novel. Well, I like to add that this undertaking is, intrinsically (in the undertaking) and ideally (in the creator’s vision), a heroic work. And then I always say that a hero (or an anti-hero) is essential to the story. By and large, this is the model of the vast majority of successful graphic novels. Most of these works are biographies and borrow from history in one form or another. The fact is, to do this right, you don’t want to get bogged down by the facts. This is a work of entertainment, not a meticulous history. Johnson is spot on in how he incorporates history into the bigger picture of his narrative. Everything lifts off the page as we follow accessible characters and vivid action. 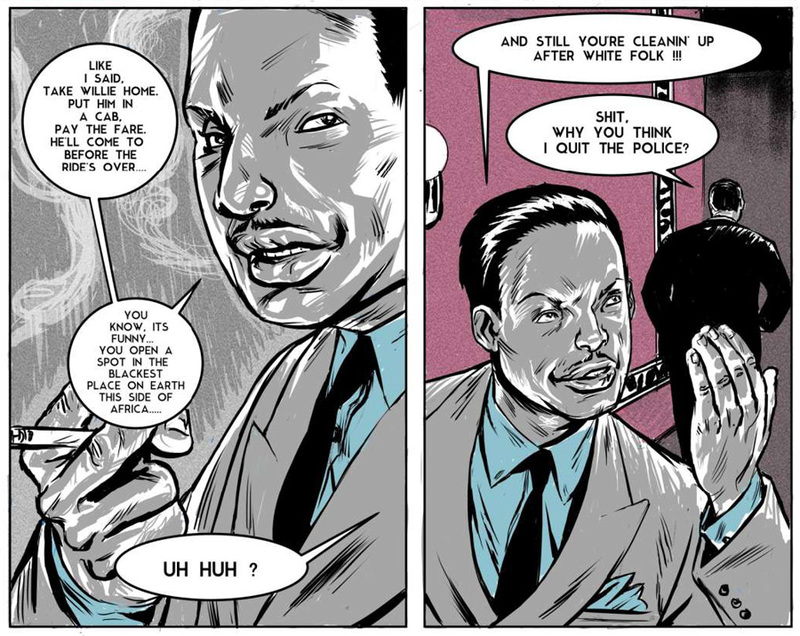 Graphic novels, when true to their original intent, are vivid works of sequential art that evoke the breadth of a prose novel within its own unique narrative structure. Johnson is sensitive to what is possible in the comics medium. He has done the legwork necessary to create a credible foundation as he goes about completing his full-length graphic novel. The artwork is dynamic and the pacing is compelling. Essentially, he has found something that can be quite daunting for many a cartoonist lost in a fog. Johnson has found something to care about. He is compelled to follow through on his vision. This first issue clearly demonstrates that. Be sure to keep up with Craig Johnson II right here and THE LEGEND OF PINKY, and Carbon Age Comics, right here.